These days, I've been looking for a video player worth using. Ever since BSPlayer fell into disgrace due to adware included in the free version, I searched for a neat player, simple yet powerful enough to allow me to view movies encoded with the latest technology. In my search, I came across KMPlayer. The program has no setup kit; instead, all you need to do is to unzip the downloaded archive into a location of your choice and run the executable file. You won't need any pre-installed codecs because the producers took their time and implemented all the codecs you will need; just make sure you keep it up-to-date. The user interface is neat and intuitive, all options are available on right click. The program has multi-language support: more than a dozen with the possibility to get more. It can handle pretty much any known video format, from 3GP to DVD. The options are amazing. I'll just mention a few that impressed me a lot. Otherwise, you can do with this small player a lot of things: you can pan and scan video files, capture content, rotate, flip or mirror view files, load and find subtitles on the Internet. Another neat feature is the KMP built-in Winamp Preferences Panel which provides a quick access to some of Winamp's options. 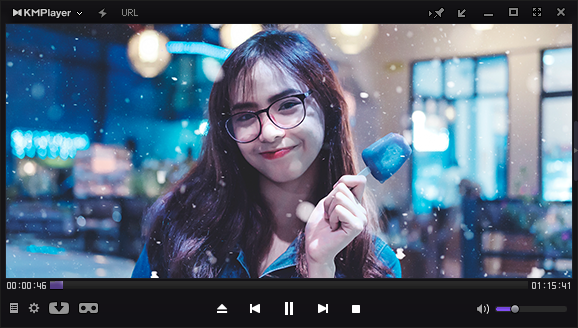 In conclusion: In case you are looking for a complete video player, with lots of playback options and filters, you might as well download this one. I know I'm in love with it.